Macklemore and Ryan Lewis are going on a “camping trip” — an eight-stop late-summer tour of venues around Washington — which includes an Aug. 31 stop at the Admiral Theatr e in Bremerton. Tickets went on sale at 10 a.m. May 20 — and sold out in less than an hour despite limited advance publicity — for the show, part of a tour that also will make stops in Spokane, Yakima, Walla Walla, Enumclaw, Olympia, Hoquiam and Bellingham. 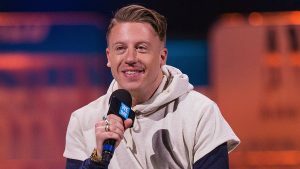 The shows were announced by Macklemore and the Admiral on their respective Web sites and social media outlets only when the ticket sale began. According to Admiral general manager Brian Johnson, Macklemore wanted to keep advance notice of the shows to a minimum, publicizing them only at the last minute on social media. The theaters involved in the tour were allowed to post their own notices only after the ticket sales had begun. The “Thrift Shop” guys finish a long summer tour with a show in Jakarta, Indonesia on Aug. 13, but will be back in action just 10 days later for the “Camping Trip” swing, which begins Aug. 23 at the Bing Crosby Theater in Spokane. Following the Admiral stop, there’s one more campsite in Bellingham before they return to Seattle to headline the Bumbershoot music and art festival Sept. 2-4. Other shows on the “Camping Trip” include the Seasons Performance Hall in Yakima Aug. 24, Main Street Studios in Walla Walla Aug. 25, the Chalet Theatre in Enumclaw Aug. 27, the Capitol Theatre in Olympia Aug. 28, the 7th Street Theatre in Hoquiam Aug. 29 and the Wild Buffalo in Bellingham Aug. 31. General admission tickets for the Admiral show and the others on the tour were $20. The Admiral business office was closed during the morning hours (staffers probably were girding for a night shift, with the Kingston Trio in town). The ticket office closed as soon as the last of the “Camping Trip” tickets were sold. Maximum capacity for the show is 999. Ummmmm, why is this article being published 44 minutes AFTER tickets went on sale? The concert is already sold out. Maybe notifying your readers of this event with an alert on our apps (I got one the same time the article came out ) BEFORE the tickets go on sale would be a good idea for the future. SMH. Scott I’m sure the newspapers would have loved having the information ahead. Pretty sure it was done this way intentionally. Its not their job to inform us of Macklemore shows. The point of the article was to say that there is a secret show and the tickets sold out within an hour. I don’t believe there was any public advance notice of the tour/ticket sales. I just so happened to check my mail at 10:30 a.m. and got the notice from the Admiral. This leaves a very sour taste in the mouths of the general ticket buying public.